In all fairness, this quilt was like, 70% quilted when I tucked it away, and it’s a small quilt. Still, it’s finished, and I feel better for it! 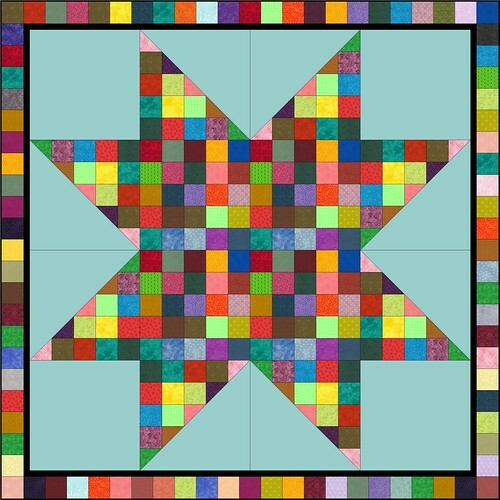 Neutral Star is a baby quilt, measuring 40.5″ X 40.5″. I started it on a whim in November of 2015, so it’s a very recent start. It’s another riff of the Made in Cherry quilt pattern, which is available for free via the Lecien webpage. 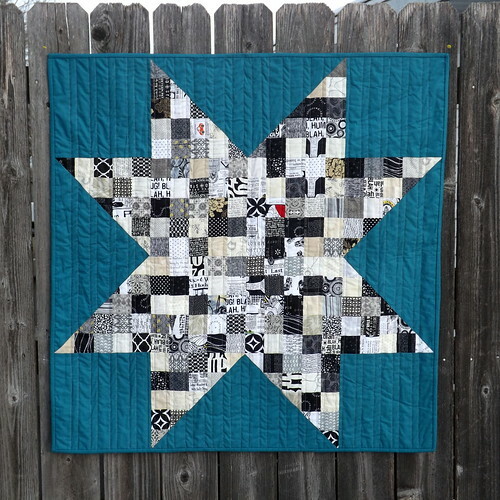 Rather than piece this out of charm squares, I used pre-cut, scrap, 2.5″ squares from my scrap bins. The background and binding fabric is a Cotton & Steel solid called peacock, which I used previously in Spice Garden. 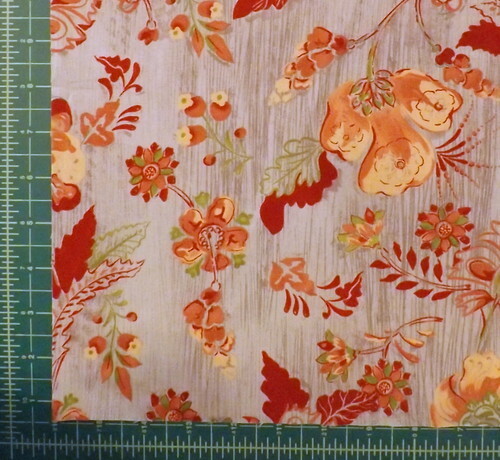 No photos of the backing – I decided to use up two prints that were languishing in my stash. I’m not counting them against my total for the 2016, because I pulled all of the fabrics for this quilt before the new year even started. It needs a washing – I can’t wait to see it when everything’s all crinkly fresh from the dryer, but I’ll get to see that soon. Laundry day approaches, lol. See my original list of goals here. Also linking to Finish It Up Friday and Can I Get a Whoop Whoop. I had Tuesday off from work, so I planned for Tuesday to be a sewing day. I thought I’d buckle down and work on the November’s sewing commitment. I let myself get psyched out by it again, and instead decided on some easy piecing. Over the course of the day, with several breaks for meals, kiddo time, and napping, I put together a crib sized quilt top. I used my pre-cut scraps stash, diving into my neutrals bucket and using a good portion of the 2.5″ squares. I also used more of the Cotton & Steel Peacock solid fabric. Eventually, I’ll use up the entirety of the six yards I bought. 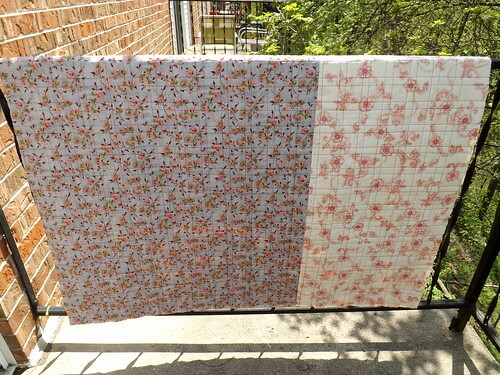 The quilt top measures 40″ X 40″ (finished), and should be a breeze to quilt. I figure I’ll do straight line quilting, to keep it simple, and manageable on my domestic machine. Apparently, this particular pattern ( a riff of the Made in Cherry pattern by Sarah Fielke) is going to be a go-to pattern for me. It’s a riff, because the original pattern called for charm squares. 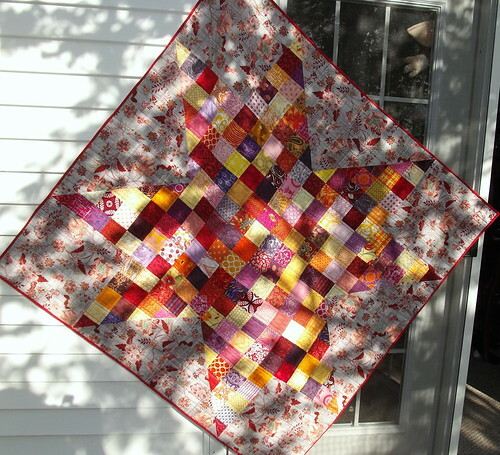 In addition to using 5″ squares, I’ve previously made this with 3″ squares. 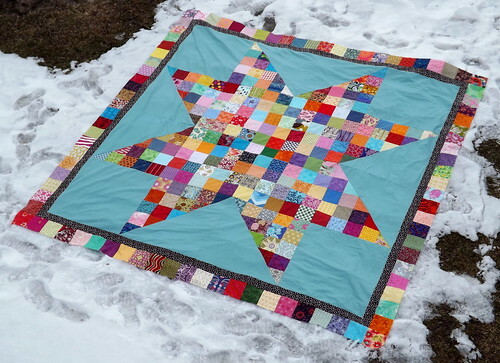 The 3″ squares make for a quilt top that finishes at about 50″ X 50″. Of course, it helps that I can throw one of these babies together with very little math, and a whole lot of variation, depending on the fabrics used. Almost a year ago, I stumbled across the pins and bobbins Made in Cherry Quilt-Along, and decided that the project was a great way to use the charms I was receiving from a swap. It was also a great way to stay motivated in managing my scraps. Being who I am, I of course had to draw the design up in EQ7. The original pattern by Sarah Fielke didn’t include any borders, but I liked the look with borders. If you look closely at the illustration to the left, you can actually tell that I did my quilt-y math wrong. The black, inner border isn’t wide enough. It needs to be twice as wide. But no matter. I realized my mistake well before I actually added the border. I actually finished the center of the top months ago, in June 0f 2012. I also recognized some issues that had taken place in the cutting, causing some major waving in the big triangles. I then folded it away, to await my participation in a second charm swap, to get enough for the border. Unfortunately, real life conspired against me, and I wasn’t able to join in. So, the top sat, unfinished. For quite a while. Until I decided that I had gotten through enough of my scraps to do the border. Ha! I ended up needing to cut 51 charms my stash, which I accomplished yesterday. This was after spending a day picking apart the major seams of the top, to fix the wavering issues. Very late last night (or very early this morning, depending on your definition), at around 1:30 AM, I finished adding the second border. It was entirely too big to photograph in my apartment, so I took it to work, thinking I could have a couple of students hold it over a railing. That didn’t happen, since I spent work working on a report and catching up on tasks. Plus, I have a sinus cold going on, and staying away from Kleenex for too long was not an option. So, once I got home, I took advantage of my balcony once again, and caught a photo. Overall, I’m pretty happy. 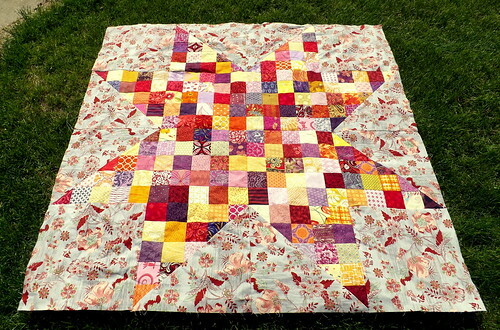 I was very worried, as I pieced the final border, that I would have too much pink, yellow and green in it. I have very little blue in my stash, and by the time I got toward the end, my charms were definitely leaning toward the warmer side of things. Cool beans for me – the inner border used up the remainder of a fabric in my stash. The backing and the binding will also come from my stash. Happiness. Working on Fun with Free Piecing (which should really be called Cheating on the Farmer’s Wife, Part Deux) illustrated to me that I really, really need to get my scraps under control. I have a lot of them. I could probably fill a kitchen garbage sack with them. The original, Sarah Fielke pattern didn’t have any borders, but I think I much prefer adding the two borders to this. I just really like scrappy borders, and any reason to use them, I swear. So I started cutting charms. I’ve decided to try and do a similar quilt, but one in which each charm is unique. So now I have a lot of pre-cut squares. I suppose it’ll be nice. 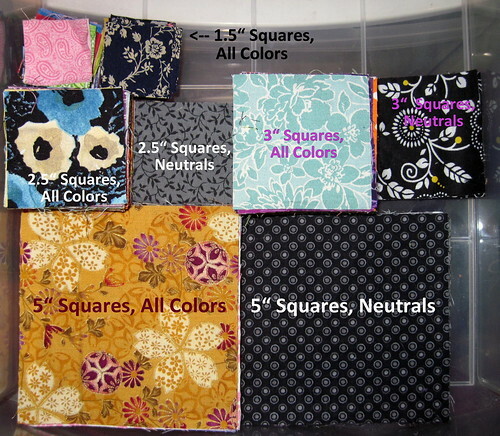 I’m a little terrified that I actually went and cut 1.5 X 1.5″ squares. 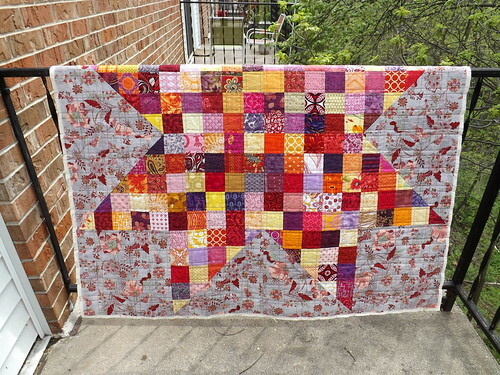 I see a postage stamp quilt in my future if this keeps up. Or a couple of Made in Cherry pillow shams. Darn it! I need to stop planning projects! !